Our process has expanded upon the aversion method developed by Ryan Folse, DVM. This multi-step process is more effective than any other form out there. We are the first to use a variety of rattlesnake species and sizes specific to the particular areas in which you and your dog live, work and play. Every snake species has a specific odor and pattern that your dog can recognize. Since some dogs generalists and some are very specific, it makes sense to try to cater to the most specific dog out there. We start by introducing your dog to a small, live, muzzled, juvenile rattlesnake, native to your area. This allows your dog to make the proper association of the danger involved with the rattlesnakes in a non-threatening or intimidating introduction to the process. This facilitates more curiosity and less initial concern of the "new" animal in their environment, putting your dog in a better psychological state for learning during the training process. Using a low-level electronic stimulation collar we essentially make the dog think that the interesting creature they are staring at, smelling, or wanting to pick up causes an uncomfortable pinch/cramp sensation whenever they engage it, therefore beginning the aversion process. We set up each dog to think that the snakes are doing this to them, not that we, as humans are telling them "you leave that alone or else!" 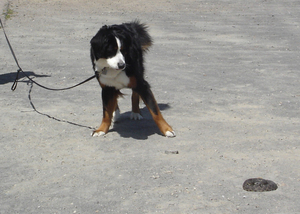 That way, a dog is much more likely to avoid rattlesnakes when alone or out and about making their own decision. The next step further focuses on the scent of the local rattlesnakes. Using a freshly-shed skin of a local species of rattlesnake, we will help your dog identify scent-based aspects of rattlesnakes apart from seeing the animal in the environment. The same process used to teach your dog about the danger associated with the juvenile rattlesnake will again be used with the shed skin. We then introduce your dog to the sound of the rattlesnake's warning rattle, again, independent of seeing the rattlesnake. A live, muzzled rattlesnake is kept in a natural looking blind. Your dog will not be able to see the snake, but the snake will be able to identify your dog and alert with its warning rattle. When your dog exhibits interest in the sound, a low-level electronic stimulation will be given. This convinces your dog that the sound itself can cause discomfort, teaching your dog to make a safe retreat without having to identify the rattlesnake with any of his/her other senses. During the final test, your dog will be introduced to a safely-muzzled adult rattlesnake that has been placed in the return path on the way back to you in as natural a setting as possible and encouraged to behave "naturally." 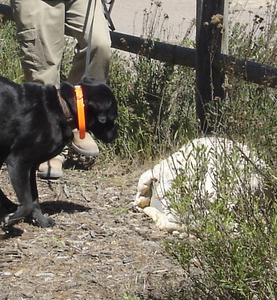 During this part of the process our trainers will try to guide your dog toward the adult rattlesnake. Your dog may identify the adult snake from a distance using what he or she has learned from the other steps of the process or may be distracted by you and get an additional lesson to be aware of his or her surroundings. We will then ask you to call your dog and allow them to problem solve and then make a wide arc around the rattlesnake to get back to you. When your dog identifies and recognizes the danger associated with the rattlesnake and makes motion to avoid it accordingly, he/she has passed the training. 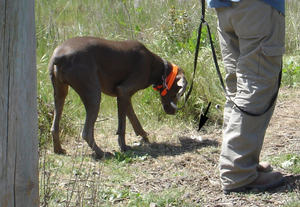 * We would also like to note that all dogs "choose" the level of intensity used with the collar during our training. We start ALL dogs on a very low level and which is slowly increased, if needed, until the dog responds, and under most conditions will not be elevated beyond that intensity. Good timing is far more important than a strong level of stimulation from the collar. We do not believe in "shutting dogs down," but instead believe in working within each dog's individual needs. IMPORTANT CONSIDERATIONS FOR CHOOSING A SNAKE AVERSION COMPANY!!! We are not the only company that offers this life-saving training. Many are both professional and effective while many are not. Here are some things to factor into your decision when looking for snake aversion companies. 2) HUMANE AND APPROPRIATE HANDLING All animals should be handled humanely. Inquire as to how the snakes are "made safe." The pulling of fangs is ineffective as snakes have several reserve pair that have potential to move into place within a couple hours of removal, not to mention this can severely damage the snakes. Gluing or duct taping the snake's mouth shut is illegal and can be considered animal abuse. Is care taken to make sure the snakes are kept at a healthy temperature (not too hot or too cold)? The handling of dogs should be gentle yet assertive. The dragging of dogs at the end of the leash towards a snake they already want to avoid is abusive. Also, if a trainer thinks they need to "correct" a dog with the highest level available by the collar, then they obviously don't understand the psychology of what they are doing. 3) HANDS ON The trainers/handlers and their associates should perform ALL aspects of training. It is unsafe and irresponsible to have untrained volunteers handle any animal involved in the training. That said, how can you expect a trainer to be able to best recognize the subtle cues from your dog at a distance greater than that of a leash? 4) MULTIPLE SCENARIOS Make sure the training takes place in several stages. Your dog needs to be able to recognize all cues given off by the snakes, in the order of importance of your dogs senses: first Smell, then Sight, then Sound. Also important is the use of juvenile snakes. Many of the dogs previously trained by other companies with only larger/adult snakes fail this stage of our process and would have otherwise been bitten. 5) LOCAL LIVE RATTLESNAKES Make sure the trainer uses snake species endemic (local) to your area. Though some aspects of the rattlesnake are universal across species, many are not. Different species of rattlesnake can have significantly unique odors to a dog's superior sense of smell. Different snakes also adopt different defense postures, along with having very different color and patterns for your dog to recognize. Western Diamondback Rattlesnakes, although big, impressive and dependably loud, are not native to most areas of California, Nevada, Utah, or Colorado. They should not be the only species used during the training. Similarly, the use of non-venomous, fake or dead snakes as "stand-ins," is only marginally effective at best as many dogs distinguish between them and LIVE rattlesnakes. Many arrogant trainers will dismiss these factors and tout their years of experience. Please be diligent with whom you trust your beloved dogs safety and well being! Don't be afraid to ask questions and if you are the least bit apprehensive with your trainer, you always have the right to back out and should never feel financially obligated to participate if you are not comfortable.